Whether you’re planning on shopping in stores on online, apps for iPhone, iPad and Android devices can give you peace of mind when it comes to making purchases. Find out when to buy, get alerts when prices drop, price comparison shop from within stores, even browse the Sunday circulars for coupons and deals. Here are my favorites. I always question whether I’m getting the best deal when I’m shopping in a store. But with a price comparison app like ShopSavvy (free in iTunes and Android Market and iTunes), I can check the price at local stores and online retailers easily. I simply input the product name or scan its barcode and the app will pull up pricing at local and online retailers (including Amazon, which is key for me since I get free 2-day shipping with my Amazon Prime membership). For local retailers, I check to see if there’s a blue dot, which means the product is in stock. And if I’m just browsing, I can always go back to a list of the products I’ve looked up. Listings have the price and a photo. RedLaser (free in Android Market and iTunes) is another great choice. I find its barcode scanning works better in challenging lighting conditions than ShopSavvy, but it doesn’t pull in regular Amazon pricing, just Amazon Marketplace. But you can always download Price Check by Amazon (free in iTunes and Android Market) to supplement. I hate to see a product I’ve just bought go on sale. And with Black Friday and Cyber Monday right around the corner, it’s easy to second guess when the right time is to buy a product. The best protection is to use an app that helps you decide when it’s the right time to buy. My favorite app for electronics, use the Decide.com app (free in iTunes). It shows price history, lets you know when prices drop, alerts you when there’s a new model and predicts if the price will rise or drop. For other product categories, check out LetShop ($1.99 in iTunes), which provides price history, price comparison (including Amazon and eBay) and price drop alerts. This time of year, I don’t like to buy anything without checking to see if there’s a coupon or deal to be found. 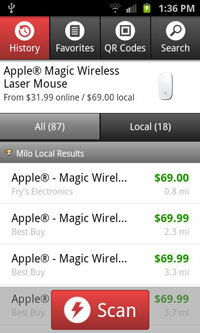 And makes it easy Dealnews (free in iTunes and Android Market) for online or offline retailers. Keep tabs on favorite product categories, like toys or electronics, and even narrow it by retailer. If I find a particular item I like, I can save it to “my deals” for future reference or even buy it from within the app. For Sunday circular browsers, I suggest GeoQpons (free in iTunes). It shows the scanned pages along with text describing the deals. 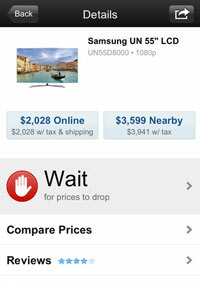 Windows Phone has shopsavvy and price checking and comparing is built into the bing vision (scan’s movie/book covers or any barcode). 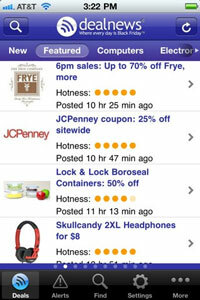 deals news app is my best app for shopping information to find a coupon for discount. here is a list of best apps for shopping.